Mouneera's colt by Ayal AA and bred by Al Jassimya Farm, was the Gold Champion colt 1-3 years old of the Straight Egyptians at the Scottsdale Signture Classes. 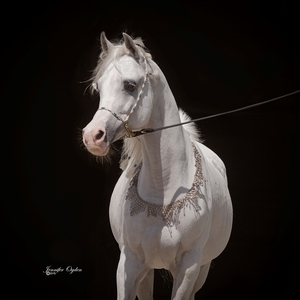 Bravo to Team AJ and HE Sheikh Jassim Al Thani on breeding Amin Al Jassimya. Congratulations to Al Jassimya Farm on a lovely large grey colt! He is truly a nice colt and for a first foal meeting expectations from this mare line quite well and of course his sire Ayal AA is a winner too. Now to choose for her next foal! The possibilities would seem endless with her beauty and quality. Although she is only three we allowed her to be leased to carry a foal for Al Jassimya Farm. A very mature daughter of Ansata Majdiya and Majestic Noble SMF. 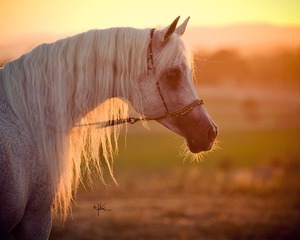 We look forward to seeing her foal by AA Ayal, the lovely stallion they leased from Israel's, Ariely Arabians. She is for sale but we will only sell Mouneera or Malak not both and of course not until the foal is weaned. Hey, not a problem as we can breed her to one of the SMF boys while you wait! Henry and I really love this fillie's dam, Ansata Majdiya, she is a gorgeous mare.The result of breeding Majestic Noble SMF to her has resulted in a magical nick. We believe this is because we used an intensely linebred stallion, Majestic Noble SMF, on an intensley linebred mare, Ansata Majdiya. 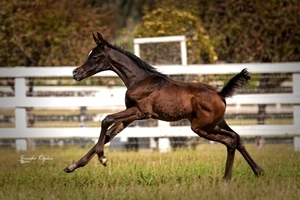 It is not so easy to influence intensely linebred horses in any direction in our experience. So this was our idea as a solution and it is what we have found works for our vision of the "ideal" Arabian horse at SMF. Mouneera is such a feminine filly, she has a very fine tiny muzzle, great width between her eyes, sharp pointy ears and moves freely. She is almost like a ballerina with her lightness of movement. This line of mares has founded a dynasty in the Arabian Gulf Region through this mare family, we hope Majdiya founds one here at SMF with her daughters. The potential for this filly is definitely in her genetic makeup, she should breed forward quite well and along the way you can have fun showing her too. We hope to sell only one of these sisters. Mouneera SMF from Christie Metz on Vimeo.